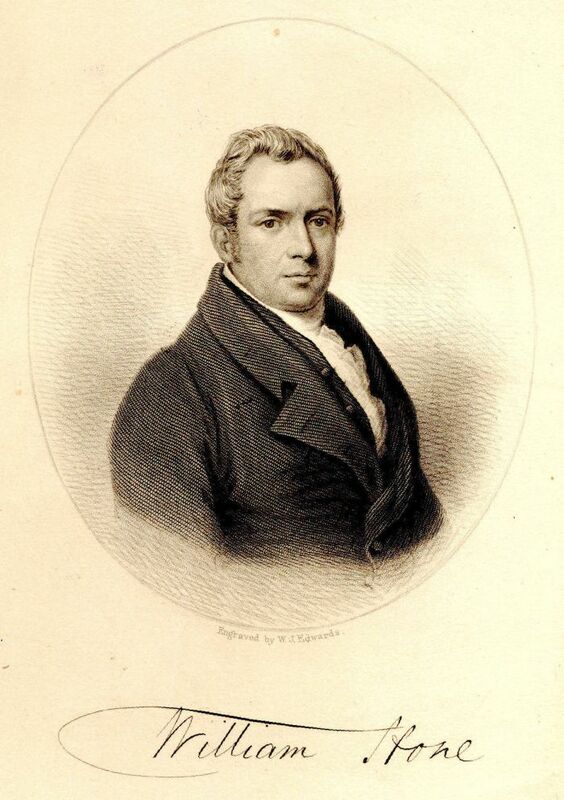 William Hone (1780-1842 ), 2 Vols. London: William Tegg, 1825, 1827. William Hone was born June 3, 1870 to William Hone, Sr. and Francis Maria Stawell Hone in Bath, England. In 1873 the family moves to London. In 1792, Hone takes first job as "factotum" for solicitor in Bishopsgate Street. The next year, he publishes a broadside critical of the French Revolution, beginning a long career political career. He married Sarah Johnson on July 19, 1800. Also in that year, he opens a small stationary shop and circulating library in Southwark. Over the years, he would open, and close, several book stores and similar enterprises. In 1817, he is arrested on three occasions for blasphemous and seditious libel charges allegedly made against Lords Sidmouth and Castlereagh. After three trials, and three acquittals, Hone becomes a celebrity. After 1820, he became less political, and focused on publishing books such as The Lost Books of the Bible (1820), Ancient Mysteries Described (1823), The Every Day Book (1825, 1827), The Table Book (1827), and The Year Book (1832). He died following a stroke in Tottenham on November 6, 1842. The engraving, left, is from The Every Day Book (Volume 1, 1825). For most days, only that information which specifically relates to the Christmas-related holiday or customs will be reproduced. In all texts, I have inserted "[?]" where I am not certain of the typography. The volumes from which I worked, at the time of this transcribing, were 179-181 years old; the text was in very good, but not perfect, condition. The bindings were poor, but this did not affect the contents. Additions are also made from other works by Hone: Ancient Mysteries Described (1823) and The Year Book (1832). I am also hoping to acquire The Table Book (1827). Advent, being the closest Sunday to the feast day of St. Andrew, November 30. December 14 - Beginning of Ember Week, an ancient fast, and the Approach of Christmas. January 1 - New Year's Day. See, also, this supplemental discussion of Hogmany. January 28 - Identified by Hone as Old Twelfth-Day, which he stated was still observed in some parts of England (Volume 2, 1827). See entry for January 6. February 14 - Identified by Hone as Old Candlemas Day Day (Volume 2, 1827). A note from Hone: To The Reader (December 1825). Amusements: The London Christmas Evenings of 1826. These Christmas Bills (January 1826), a humorous observation, as true now as then. Corpus Christi Day and the Performance of Mysteries (June 2), an extensive discussion of the mystery plays. Concerning the derivation of Lamb's-wool (from the entry for October 31 in Volume 1, and other entries). St. George He Was For England; compare these two plays from William Sandys: Christmas Play of Saint George (1833) and Christmas Play of St. George and the Dragon (1852). A Mock Play; compare this play from William Sandys, A Mock Play (1852). William Hone, The Year Book of Daily Recreation and Information. London: Thomas Tegg, 1832. December 11. ... Masks and Mummers. — Mummers shall be imprisoned three months, and fined at the justices’ discretion. The penalty for selling visors, or keeping them, is to forfeit twenty shillings, and to be imprisoned at the discretion of the justices. — (3 Henry VIII. cap. 9). Frederick William Hackwood, William Hone: His Life and Times. Augustus M. Kelley, Publishers: June 1970.